For the last ten years, this niche business-to-business publication—that is South Africa’s pre-eminent energy publication—has given its readers the opportunity to easily deliver products and services to its focus market. With all forms of energy now crucial to the future economic, political and social futures of every country in the world—especially the Africa continent—Energy Forecast has provided a comprehensive coverage of exploration, development and innovation every quarter. While attention is given to traditional carbon fuels and nuclear power, the publication has provided an abundance of news about the alternative sources of energy being developed with ingenuity around the African continent, together with an emphasis on water and climate change. The partnerships and collaborations made, and the stories that have been featured by Energy Forecast over the past decade, are indicators of the consistent growth of the publication throughout its journey of exposing readers to new technologies and exciting initiatives, both locally and internationally. The publication has been a window for industry players to witness the achievements of their fellow colleagues and to identify new opportunities within the sector. 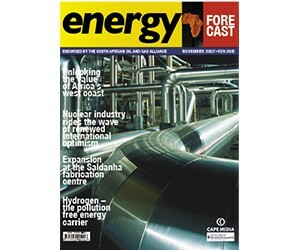 Energy Forecast has brought insightful interviews with, and written by, a number of specialists in their field that include nuclear physicists, environmentalist scientists, chief executive officers, leading companies and organisations who are all passionate about the energy sector. Energy Forecast magazine is endorsed by the SA Oil and Gas Alliance, the South African Energy Efficiency, the Sustainable Energy Society of Southern Africa and the South African Photovoltaic Industry Association.